Ex Hot Girl: Hey you, Obese chick! Today I hit 190.4 which is a milestone in one and almost two ways. The big celebration today, for my 5'7" frame, I'm no longer obese. I'm now, simply, "overweight." (((cheers)))! 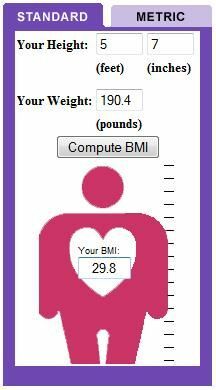 To calculate your BMI, go here. Or, I think there might even be a calculator on the right side column of my blog. SO, my next BMI goal will clearly be 24.9 so I can become "normal." That means I need to get down to 159 pounds. From 190.4 to 159 is a loss of another 31.4 pounds (wow!) ... Yep, I've still got a lot of work to do. ...Also, have I mentioned that I love you guys? You're the best, seriously. You keep me accountable, motivated and feeling like I'm not alone on this weight loss journey thing. Well you just KNOW we love ya right back! THAT IS BIG NEWS!! You may be able to go to doctor's offices now without getting the "weight" talk, or consideration, etc. You have been chipping away at this in such a consistant way, I hope you are PROUD!! Congrats on the HUGE milestone! :) Keep up the great work! woohoo, way to go this is good news. You are lucky you are on the taller side Im so short that the only way to be overweight is to weigh 160 pounds lol. Its so hard when you are short, tho I believe when you are obese that loosing even a small amount of weight is good for you! Happy there's one less person residing in Obese City these days. Wahoo! Yay! Bells! Whistles! That is absolutely awesome. Congratulations!! Whoodiefreakinhooo!!!!! is right. Congrats on just being overweight. You'll be "normal" before you know it. Keep up the good work. You rock! Oh hooray for you! I think I'm still in the "morbidly obese" category. You look awesome! Congrats! Definitely a milestone, worth being proud of. I reached the same milestone on the same day! I'm 29.9 on the BMI chart now. The more I see you the less I see you!!! Keep in high spirits to land in normal zone! I know you absolutely will and can do it! WELL DONE LADY :) You're doing SO good, that is a huge milestone! Awesome progress!! You must feel great! Isn't it true that nothing tastes as good as losing weight feels!! OMG! Jen!!!!! 190!!!!! Wow! I'm so happy for you!!!!!! Congrats!!! !